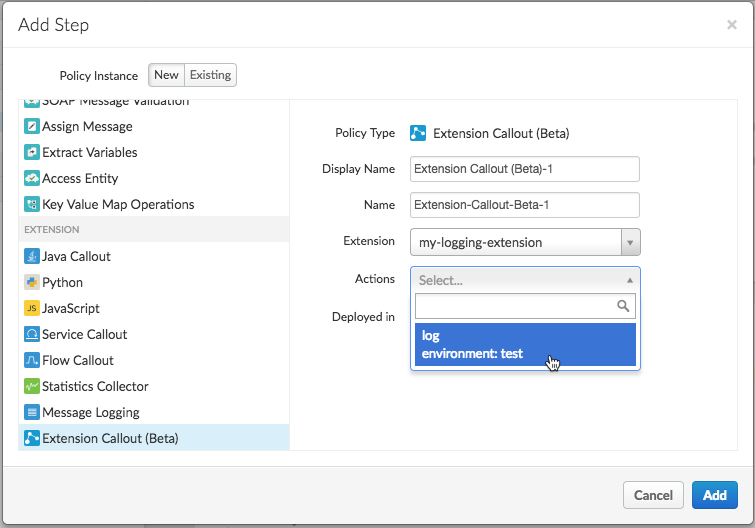 When you add support for an extension, you're associating the ExtensionCallout policy with a configured extension. That extension configuration's settings define how the extension interacts with the backend resource it's connecting to. It's this specifically-configured extension that the ExtensionCallout policy integrates into the API proxy. The extension you want to add to an API proxy must already be configured and deployed to the environment where the API proxy will be deployed. Open your API proxy in the Apigee Edge console, in the Develop view. In the Navigator pane, select the PreFlow. In the upper right corner, click the + Step button to add a policy. In the Add Step dialog, in the policy list at the left side, click Extension Callout. If you don't see the ExtensionCallout policy in the list, be sure you're using the new Edge UI. In addition, Apigee Extensions is currently available to Apigee Edge Cloud Enterprise customers only. Display Name Enter the policy's display name. Name Enter the name to use for the policy programmatically. This must be unique in the proxy. Extension Choose the extension to use. This is the extension you configured earlier. Actions Select the "log" action. 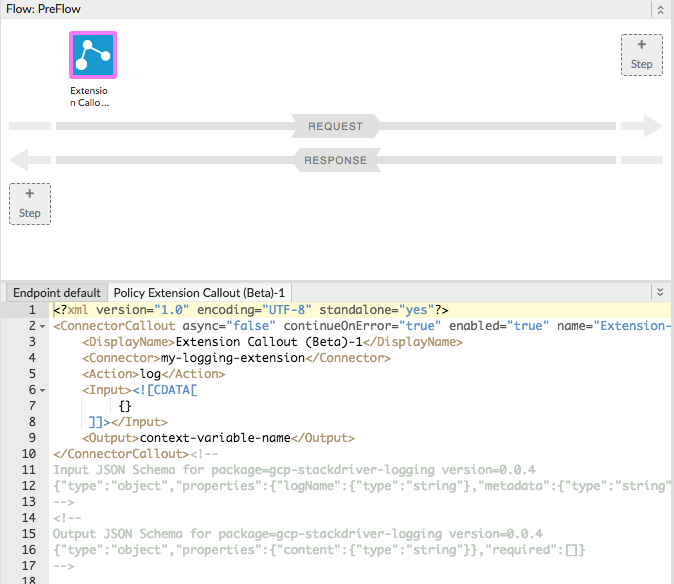 In the flow view, click the policy to view its configuration XML. logName is the name of the log to write to. If this doesn't exist, it will be created by the extension. metadata specifies information you can use to browse for the log in the Stackdriver console. message is simply the log message you want to write. You've added an ExtensionCallout policy to your API proxy. Next, you'll deploy it.